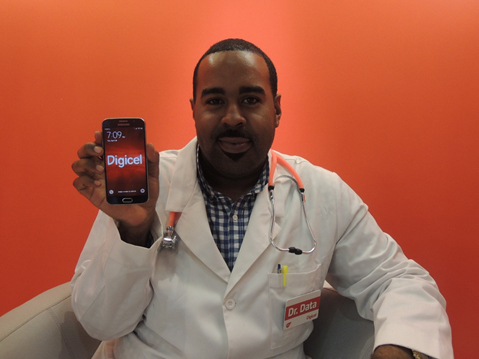 Deciding between whether to prescribe to the Samsung S5 or S6 can be difficult, and as Dr. Data I feel that it’s best to make an informed decision when it comes to such matters. When looking at the Samsung S6, the sleek design of the S6 gives the device a modern appeal. Gone are the days of the plastic frames of the S5, the S6 features an aluminum frame and 2.D Gorilla Glass 4 screen. If you are suffering from buying yet another phone case to decorate your drab phone, the slick design will cure your ailing bank account. The Samsung Galaxy has not seen an upgrade on the screen clarity since the launch of the Samsung S4. For the first time, the Samsung S6 features a Quad HD display along with a new CMF solution, giving it a clear TV like appearance. If you frequently have problems with the fingerprint reader, the touch sensor now requires only a single tap and will offer you convenience and ease. The touch screen also has the ability to double tap, in order to launch the phone without even unlocking it. The Lollipop operating system of the Samsung S6, has all of the functionality of its’ Kit Kat predecessor but with added design and ease. If you find yourself influenced by aesthetics or describing yourself as a visual person, you will like the 2D look of icons and simple lock screen. Alternatively, if you often find yourself annoyed by notifications disrupting you, they now discretely appear at the top of your phone. If you suffer from an addiction to selfies, then the Samsung S6 is right for you. Although the rear camera is 16MP on both devices, the Samsung S6 now features a 5MP front camera compared to the 2MP of the S5. The camera also has unique features such as a voice command whereby, the user says smile and the camera automatically snaps a picture. Most impressively, the Samsung S6 features a sensor on the back of the device that you can swipe when taking a selfie. This lets you take high quality images without the hassle. The S6 not only sees a major upgrade to an Octa core processor and 3GB of RAM, but also the introduction of Microsoft OneNote and OneDrive being preloaded into the device. In my professional opinion, the Samsung S6 has all of the great elements of the S5 with impressive upgrades that make it feel like a device in a class of its’ own. Looking forward to seeing the lines outside the Cellular phone companies doors for those that have trouble feeding their children and paying their rent to buy these phones to do nothing more than text their friends from their new phones! Have fun!!! Know what else would cure your ailing bank account? Not buying a new negligibly more capable phone every year or two. Pretty much all the reasons I’m not upgrading my S5. I prefer my rubberised and plastic frame bucko…speak of your diminutive comparison as your opinion…and your opinion only…then…please understand that that frame and rubber add a level of protection that is additional and effective…why discount it as non necessary…foolishness statement really….as I understand you explain the durability of newer models I understand the need for casement less necessary …however….the case offers additional protection. I’m so excited about the release of the Samusng Galaxy S6! i’ve heard so many great reviews, and i had a peek in one of the Digicel retail stores and it looked amazing! i will be purchasing one of these for sure! Looking forward to trying this out. Love Android and excited that we’re starting to get cutting edge technology in earlier and at not completely extortionate prices!